I truly believe that I am on this earth to achieve something special someday. I can’t put my finger on exactly what that special thing will be, but it will happen. I’m not having an easy time of it lately. Seven months ago, I lost my mama who was also my best friend. I think I heard somewhere that it takes a full year to grieve. My grief is taking longer than I thought it would. It is finished when it is finished. This first year is difficult: especially the first Mother’s Day, Rosh Hashanah, or Hanukkah, the first birthday, etc. I try to sort out my feelings on a daily basis. I’ve been oversleeping when I should arise early for my runs before work. The oversleeping, I figure, comes from lots of standing all day and lots of thinking all night. She is always with me with subtle and not so subtle reminders. But I know this to be true: My mama loved that I ran. She was and is my biggest supporter. So, I know that I must get my runs done. You see, I am planning on running Marine Corps Marathon in 5 weeks. 35 days. HA!! My coach has confidence in me that I will finish. My mama has confidence in me that I will finish. So, I shall finish. Saturday was the New York Road Runners Continental Fifth Ave Mile. I never ran this race in all the years I’ve been running. This year, I decided to sign up. It’s only a mile, I thought. No biggie. As the race day got closer, I realized I may not do as well as I had hoped. Every single run, my legs felt sluggish. I don’t even really know why. But, then speaking to a friend, she reminded me that grief not only affects you emotionally, but physically as well. So, knowing this helps me to not be too upset when my runs don’t go the way I want them to. Race day came and I just decided this: Run, have fun, do my best. Coach Caleb said I might be pleasantly surprised. I believed him. I ran an 8.25 mile. I was indeed pleasantly surprised. I am no racer. I don’t have strategies or plans, I just run. So the run, have fun do my best turned into a pretty fast mile, for me. When things don’t come easy for me, I think I appreciate them more. Today was a 2 hour 45 minute run. Hard. So very hard. But I completed it. My calfs are now very tight and my heels hurt a bit. That’s alright. It will go away. I want to enjoy life now. I can do lots more things without having to worry or concern myself about who will be there to take care of my mama. Last year, I missed lots of things. Concerts, parties, runs. And, don’t get me wrong, I am not complaining about that. It’s just a fact. Now, that I am “free” to do as I please, I find it odd. My job gives me odd hours. Most weekends, I work. I’d rather not, but I also appreciate that I have a job where I can “dress like a runner” as my dress attire. My co-workers are all really cool and actually fantastic runners. And very supportive of me. I still find heads up pennies every once in a while. I know who is leaving them for me. I like it when I find the pennies. It comforts me. I will probably hold some of those pennies when I run MCM. I am running it in honor/memory of my mama. Do you guys think I should have a special shirt made that I can wear? Any suggestions would be totes awesome. Also, the meet ups that are going to take place should ROCK!!! You know it!! The friends that I’ve made are amazing. They take an interest. I appreciate that more than ever. It makes me feel safe. So that photo up there? 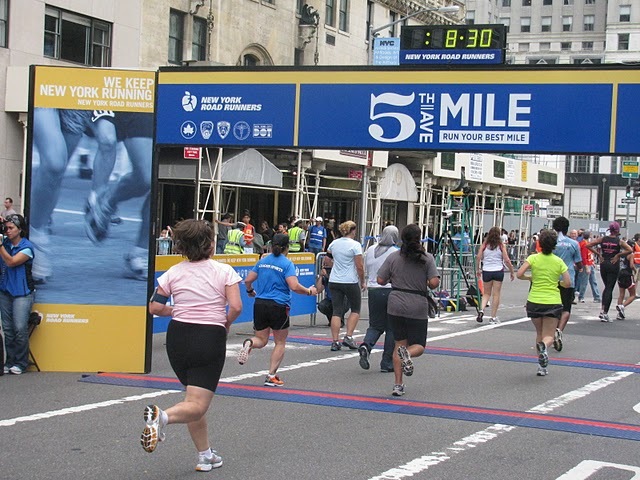 That’s me in the blue shirt crossing the finish line of the Fifth Ave Mile. Photo is courtesy of Mark Juliano. Thanks Mark. Accepting full responsibility for every little thing in your life, Michelle, is what opens the floodgates to joy and power. We all have a purpose and we don’t have to know what that purpose is. We just do it. After we’ve completed that purpose God can call us back home whenever he wants to. Nobody leaves before completing what they were put here to do. I take a lot of comfort in that. I love this post Michelle, and your perspective on everything. This is a beautiful post, thank you for sharing. You are going to finish. And I will be there to cheer you! Impressive mile, too. You are living, day to day, the only way anyone can. You’re just more aware and honest with yourself about it.